1. Immigrant Lives in the OC and Beyond poster, 2009. In recent years Orange County has become widely known via television and other media portrayals as "The OC," promoting perceptions of a largely homogeneous and wealthy "white" populace. In reality, our county has experienced dramatic demographic change in recent decades, largely due to the impact of immigrants from throughout the world. 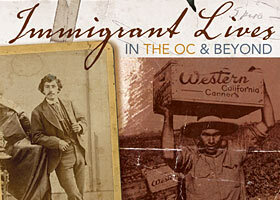 This exhibit depicts the lives of immigrants in our region, with a focus on Orange County, from the late 19th century to the present. Topics include the legacy of an often turbulent past, the changing face of the population, the contemporary debate about immigration, and issues affecting immigrant workers. The exhibit also highlights immigrants' own stories, the plight of the undocumented, public policy issues, and the role of gender in migration. Numerous books and papers written by UCI faculty authors are included. The leading country of origin is Mexico, followed in rank order by the Philippines, China, Vietnam, El Salvador, Korea, India, Guatemala, Iran, Taiwan, Canada and the United Kingdom. Immigrants are a majority of residents in Santa Ana and five other cities in the state. In fact, according to UCI sociologist Rubén G. Rumbaut, who served on a U.S. National Research Council Panel on Hispanics, Southern California has the largest concentration of immigrants anywhere in the world. Thriving immigrant communities have developed throughout Orange County despite the struggles these new residents have faced. Little Saigon and Santa Ana are well known as enclaves of Vietnamese and Latinos, respectively. Persian immigrants have settled in Irvine, as have Chinese. Costa Mesa has attracted Japanese, while Koreans comprise a significant community in Garden Grove. Many Asia-based global enterprises have established their U.S. headquarters in Orange County as well, further adding to its diversity, as the ethnic directories on display (Item 13) attest. 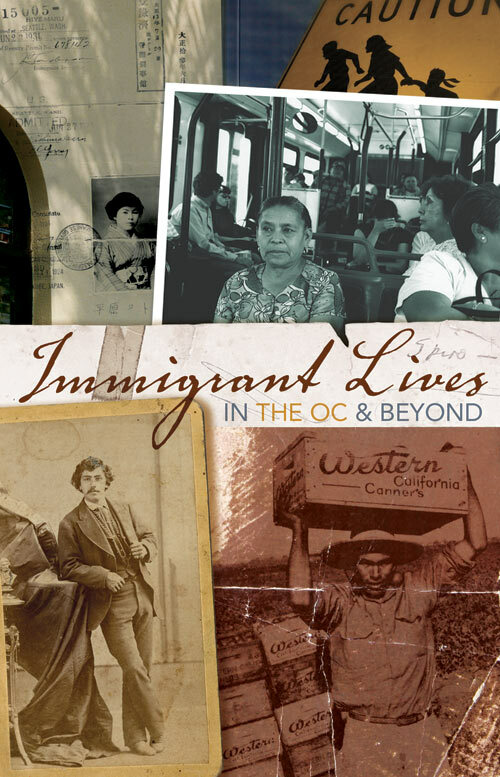 Immigrant Lives in "The OC" and Beyond was curated by Daniel C. Tsang, social sciences data librarian and bibliographer for political science, economics, and Asian American studies in the UCI Libraries since 1986. He writes: "I was born after World War II in the then-British colony of Hong Kong to a Hakka Chinese father and a Chiuchow Chinese American mother. I left Hong Kong in 1967 for California to attend the University of Redlands (Item 1). In moving to the United States, I migrated to a country I had previously visited just once during a short trip in 1957 that included an excursion to Disneyland." Most materials on exhibit are from the collections of the Jack Langson Library. Some were generously loaned by the curator, others by UCI faculty authors. Quotations are taken from material on exhibit and from works cited in the "Further Reading" section.